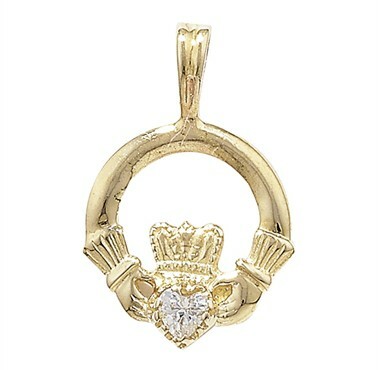 Timeless and utterly distinctive the Claddagh is a traditional Irish (Irish: fáinne Chladaigh) symbol which represents love, loyalty, and friendship. The hands represent friendship. The heart represents love. And the crown represents loyalty. Created in 9ct Gold. Comes complete with a gold chain. Actual Size: 1.9cm.